CLOSING RECEPTION: Wednesday, 16 September, 5-8 PM. Grace Nickel on Devastatus Rememorari: "Using porcelain, I am attempting to rebuild the trees by making casts of the demolished remnants. In my reclaimed ceramic trees, organic motifs and text are embedded in the trunks or applied to the surfaces of the segments that are being pieced together in a symbolic attempt to help mend the ravaged trees. The reconfigured ceramic forms embody traces of the trees' history and stand as memorials to loss. 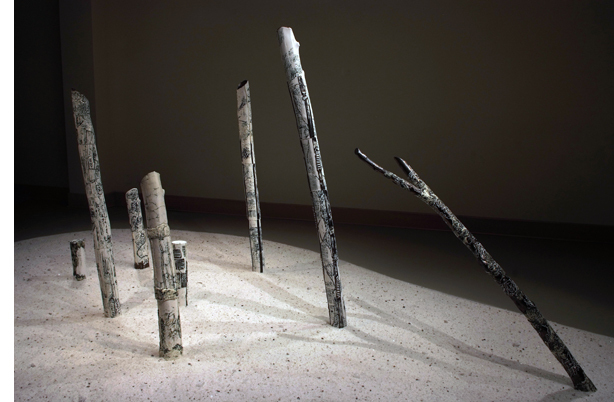 At the same time, in my efforts to reconstruct them in clay, and by creating a new textual 'bark' for the trees, I also acknowledge the potential for regeneration and recovery." 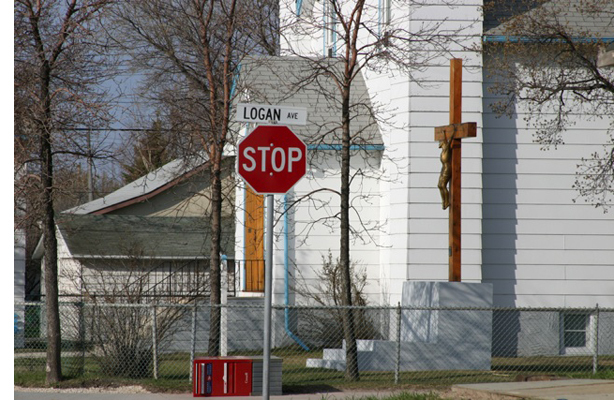 William Pura on his Logan Avenue (Winnipeg) photographs: "Starting from the old downtown near the Red River, Logan Avenue stretches northwest through a variety of residential neighbourhoods, old and new industrial areas and finally ends in the transportation hub of the modern Prairies: the trucking industry and Winnipeg International Airport. Like my other images of the city, the human presence in these photographs is alluded to but not depicted in an obvious way. And like my earlier work, light, as defined by both natural and artificial sources, is an important element in defining the drama that is found in the relationships of the architectural and the natural environment."